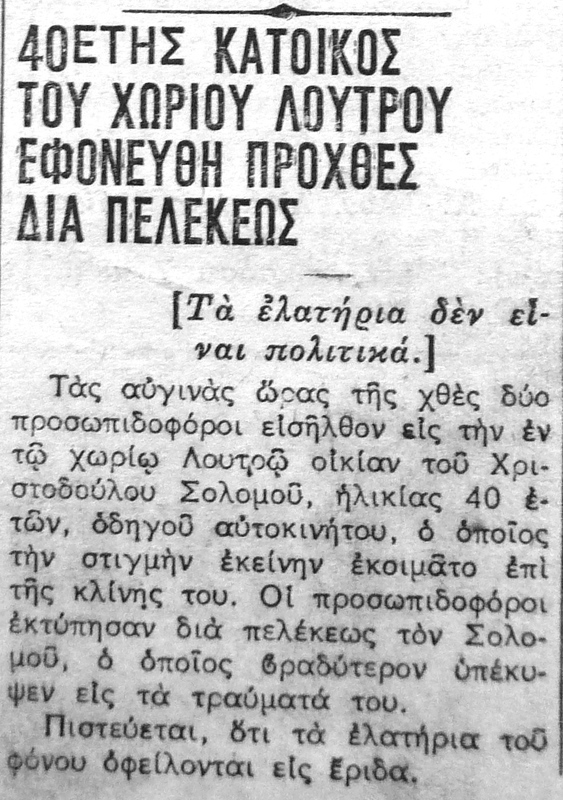 Cyprus Critical History Archive: Reconsidering the culture of violence in Cyprus, 1955-64 | A 40 year-ola resident of the Loutro village was murdered the day before yesterday with a hatchet. A 40 year-ola resident of the Loutro village was murdered the day before yesterday with a hatchet. Δύο προσωπιδοφόροι μπήκαν στο σπίτι κατοίκου του χωριού Λουτρό ενώ κοιμόταν και τον σκότωσαν με πέλεκη. Τα κίνητρα ήταν έριδα, κι όχι πολιτικά. Two EOKA fighters intruded into the house of a resident of the Loutro village and killed him while he was sleeping. The motivations were not political but they were based on dispute. N.C., “A 40 year-ola resident of the Loutro village was murdered the day before yesterday with a hatchet. ,” Cyprus Critical History Archive: Reconsidering the culture of violence in Cyprus, 1955-64, accessed April 25, 2019, http://ccha-ahdr.info/items/show/342.